York Theatre Royal offers 'play in a day', 'play in a week' and other learning activities for young people interested in drama in the school holidays. As part of my residency at the theatre, I have designed and led several of these for young people aged 12-18. ​As discrete, two-day activities, these short courses followed a different trajectory than my other practice-as-research settings: they are more structured and have planned finite endpoints (a performance), though still responsive to participants' interests. I will focus on the example of just one of these courses, which is cited within my exegesis. So many stories lead us into the forest: it is a place of refuge, of abandonment, of danger, of discovery. It is a place where boys become men and girls become women – or is it not quite that simple? Participants will work with storyteller Cath Heinemeyer to develop their own retellings of stories from Arthurian legend and European folktale, and leave none of them unchanged. The course will culminate in an informal performance in the evening, followed by a sharing of ‘Morgana Le Fay’ (itself based on Arthurian legend) by Xanthe Gresham and Nick Hennessey, to which participants and guests are invited. Only four young people, all aged 12-14, signed up for this course, all of whom were enthusiasts for myth, drama and story. Together with an assistant (himself a writer), we were quickly able to assemble a collective 'library' of forest stories and retell them to each other. ﻿I told the Arthurian legend of 'The Lady Ragnell' as a rich frame story: its texture of darkness interwoven with comedy offered ample opportunity to explore important themes (of refuge, rejection, social surveillance and gender roles), or simply to play with the interactions between its dramatis personae of crones, maidens, heroes and villains. 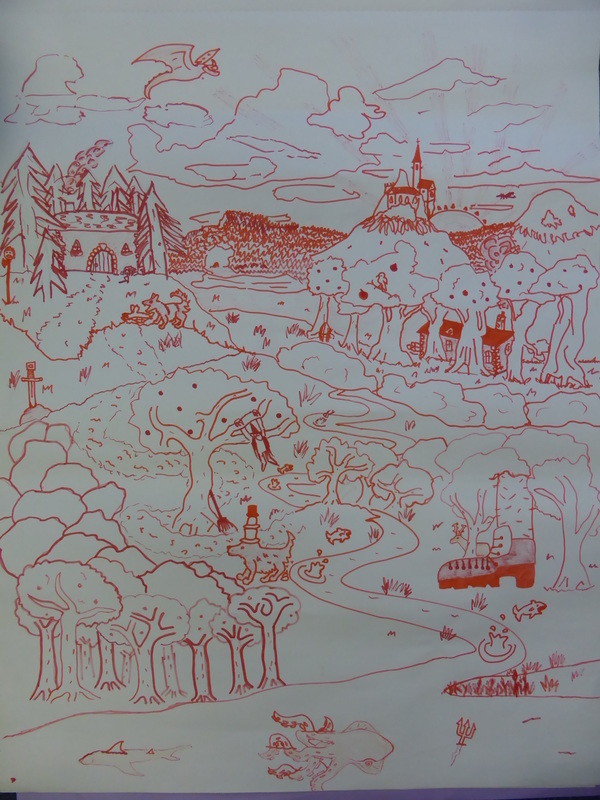 We started to develop an image of a collective 'mind forest' and two of the boys took this literally. They commandeered my flipchart and over the course of the two days, kept darting over to it to add features of our invented and gathered stories to it, creating a 'forest realm' that became the setting for our performance. These two boys, myth adepts, urged upon the other young people the dignified storytelling language they felt was in keeping with the world we were creating. 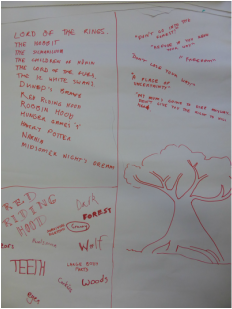 Each young person gravitated towards one character's perspective and developed their own retelling of part of the story. We focused too on Sir Gawain's quest to interview all the women of the kingdom to find out 'what they really wanted', creating extreme characters to give perplexing answers to this impossible question. The resulting performance seemed an entirely fitting 'support act' for Xanthe Gresham and Nick Hennessey's professional performance; indeed its resonances were the subject of post-show discussion. Both seemed to occupy the surreal space between epic stories and contemporary reality, gaining narrative freedom and inspiration by playing respectfully with the tropes of myth.